The late-medieval domain ‘De Batenborgh’ comprises agricultural grounds and forests. The main area is called ‘Arresveld’ (Arrisveld or Arrasveld). This higher situated plot is characteristic for the elevated areas in the Achterhoek. The domain is first mentioned in the year 1473. These old and elevated areas lie on the south side of the road in between Groenlo and Winterswijk, in the Netherlands, just behind the regional hospital, the former Coberco factory and the Beatrixpark. It lies on the East-side of the national park het Korenburgerveen, at North of the domains Groters and Mentink and close to the Tuunterveld. The forested part lies on the adjacent Rommelgebergte-hills. You can walk here using the Meekertweg and the Morgenzonweg. 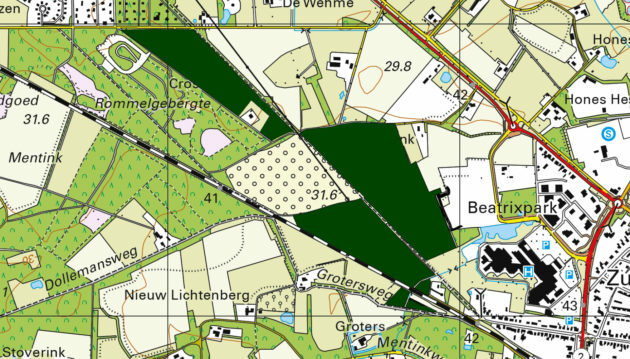 Additionally there is another parcel close to Rensink, at the junction of the Bovenslinge river and the Misterweg (the road in between Aalten and Winterswijk).The domain is limited accessible to hikers. Owner of the domain is the Geldrian ‘Foundation Vicarie Sancti Nicolai of 27 October 1501’, at Winterswijk. 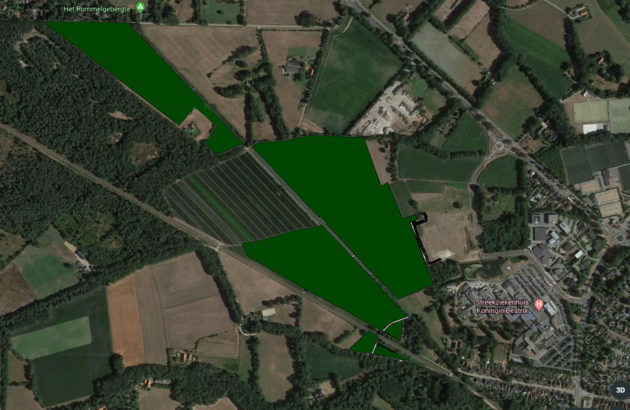 Aerial view of the North-western part of De Batenborgh estate located between the Winterswijk regional hospital and the Meekertweg (dark green parcels). The agricultural areas and hunting rights have been farmed out.